If you’ve been wondering lately as to how to change the hard coded MAC address of your network adapter, you will be happy to know that with the help of some software you can now change (mask/spoof) the MAC addresses of your network adapters for free! We have identified some of the MAC address changer tools that help you mask or spoof the hard codes of certain network adapters effortlessly. Unlike we think, IP address is not the only factor that helps connect computers in a network, but MAC address is also equally significant. So, whether you are connected using a wireless network or through a wired one, a network card is needed for your computer to be connected to others and vice a verse. The network is assigned a specific address or attribute that are usually allotted by the manufacturers and this called Media Access Control or MAC address. However, you can change them manually later with the MAC spoofing process. In order to find the MAC address of your network adapter, you need to go to the command line, press the keys (Win + R), type in “cmd” in the “Run” box and hit “Enter”. You are then required to key in the command “getmac /v /fo list” and hit “Enter” again. You will then be able to see the MAC address for each of your NIC adapters. While we already know that the MAC address changer tools help you to change the unique addresses of your network adapters, it primarily helps protect your network from needless connections. You simply need to approve the MAC addresses you want to link to the network or the internet and that’s it. While you can certainly change the MAC address of the network adapter manually through the control panel, there are quite a few software that helps you to take care of it easily, without any mess and for free! So, if you are looking to change the MAC address for verification, privacy, limited data usage, etc. you can surely make use of any of the below listed best free MAC address changer tools for your purpose. 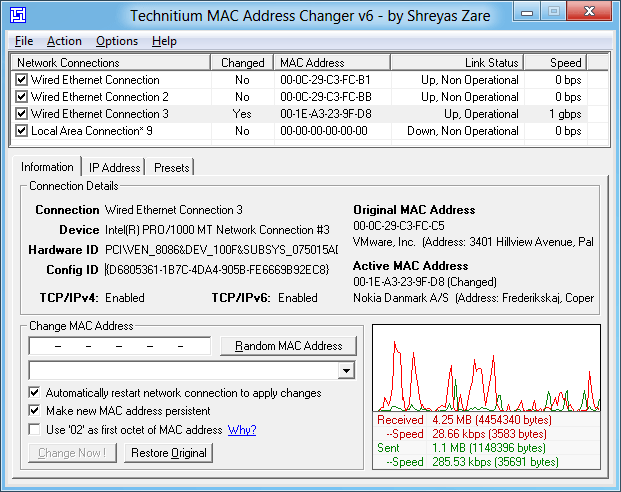 One of the top contenders in the list of the MAC address changer tools is Technitium MAC Address Changer that lets you spoof or change the MAC address of your network adapter in no time. The user interface is simple and easy to use while it displays the status, speed, network connections, MAC address, and the status if the MAC has been changed. If you wish to view the properties like IP Address or information you simply need to click on the Network Connections tab separately. It will show details like Connection, Device, Hardware ID, Config ID, TCP/IP4, TCP/IP6, Original MAC Address, and Active MAC Address. It offers abundant information related to each network adapter along with the facility to edit settings to a large extent. Each NIC is hard coded with a MAC address which is then utilized by the by windows drivers to gain entry to the LAN. Using this freeware you can assign a new MAC address to the network adapter overwriting the native MAC address. Allows you to download latest manufacturer data from IEEE.org via the update network card vendor’s list functionality. You need to toggle to the lower panel of the graphic user interface to change the MAC address. Hit the option “Random MAC address” to show the MAC address randomly or hit the “change now” option to spoof MAC address. Undo changes by clicking on the option that says “Restore Original” or import/export MAC presets with this free tool. Available in five different types, SMAC is a compelling MAC address changer that’s extremely easy to operate irrespective of whether the vendor allows the address to be changed or not. The free version is the most basic one called Evaluation Edition which offers some of the essential functionalities. However, it misses a few enhanced features that are available in the paid versions. It can also view IP config in addition to spoofing MAC address. Lookup and display of MAC address. If you are on Windows, Win 7 MAC address changer is your best bet. It is a straightforward application for Windows that can help you change the MAC address of wireless or wired NIC. It’s extremely user-friendly software and allows you to change MAC address in a few simple steps. Manually enter or create a MAC address by clicking on the “Randomize” option, and hit on the “Change” button for the new MAC address to take effect. The changing of MAC address helps protect your identity in a network, troubleshoot network issues, helps solve issues related to software and hardware items or just for some fun. You can see both the MAC addresses on the interface including the new one. If you want to undo the changes, simply click “Reset to Default” to get back the default MAC address. To export the log info in text format, click on “View Log”. Helps user keep a tab on all actions or undo any required actions with the help of the log file. NoVirusThanks MAC address changer is a user-friendly program that lets you identify the active NICs and then helps you change their MAC address effortlessly. As you can view the list of all available adapters, you can even choose to activate the virtual network cards. It also displays the current MAC address, vendor details, Address type, Network Connection type and status. It comes with a simple interface where you simply select the network adapter, click on the button “Change MAC”, input the new address and click “Change”. You can either enter the address manually or simply generate an address automatically. You can also undo the changes by hitting the “Restore MAC” button to restore it to the original MAC address. What we love about the software is that it does not contain any unnecessary information and simply displays what’s required. In situations, where you cannot change the MAC address you need to adjust the new MAC address as some of the network cards acknowledge only unique ranges. A must have for all security professionals toolkit; NoVirusThanks MAC address changer is compact yet useful. If you are looking for a straightforward application that can help you change or spoof the MAC address easily, Spoof-Me-Now can be just the one for you. It is a portable software hence you do not even need to install it. You can just drop the program files in any section of the hard disk and simply hit the executable button to run. Not just that, you can also save the software program to a USB flash drive or any other portable storage unit. You can then execute it on any PC with least endeavor and no past installers. The best part is that the Start menu does not get refreshed with the fresh entries, and hence there are no remnants left behind after the deletion of the program. It offers an interface that’s easy to use and has a clean structure with a single window where you can access all the options available. You simply need to choose a network card, find the MAC address and site the new one you want to convert it into. In just a one click of a button you can spoof the MAC address. Go to the “Spoof To” options and you will see the MAC address that has been automatically generated. If you want to change it manually, you need to choose the “Spoof” to modify the MAC address. You can take a look at the all the changes made in the log window. Expect the MAC address changing feature there are not many choices. Smart MAC Address Changer or Smart DNS Changer is a resourceful network utility for changing your DNS server and PC proxy settings along with the ability to change MAC address. The software gets installed quickly and easily with no interrupting adware. The tool was swift enough to start working in a matter of seconds. It comes with a tabbed interface and opens up the “DNS Changer” displaying different common DNS servers such as Google, Norton ConnectSafe, Comodo, Norton, etc. in addition to the default “Automatic” choice. You can then change the MAC address in just a few clicks. You can even enter DNS addresses manually in the boxes provided and click on the buttons to open the window for the Windows Network Connections and the Network Diagnostics app. It offers a “kid shield” feature that lets children use filtered DNS and browse the web normally while keeping them away from any adult sites. Using this option you can select separate DNS servers for individual users on your computer and the tab will be automatically activated whenever your children log in. Click on the third tab that says “MAC address changer”. To enable the blocked internet connection due to the MAC address, you can select the required network card here and input new one here manually. You can also use the “Proxy Changer” option by clicking on the relevant tab, choose the web page link (no proxy list available), identify something relevant, copy and paste the same into the Proxy box of the tool. Now, to change the MAC address, click on the “MAC address changer” tab find the current MAC address, and click on the “New MAC address” tab. Now select the “generate random MAC address” option to auto-populate the new address or just manually enter one. Click on “Apply MAC Address” and bingo, your MAC address is changed! This is basically a DNS changer software that also helps with MAC address change. A lightweight MAC address spoof software for Windows, MadMAC comes with a compact and a moderate graphical user interface. In order to spoof the MAC address you simply need to choose the network card interface, input the MAC address manually and then eventually save the settings to bring the change to the MAC address. Except for the MAC address changer, there are no other choices available on this software. In order to configure the address, launch the EXE where you want to be run from. Select the interface that you want to change. In case you do not want to randomize the MAC address, you can enter the prefix manually. Now check the box that says “change default MAC address on this interface” or check the box that says “Check if this is a WiFi NIC (or some problematic wired ones) under Vista/7/8 (2nd nibble randomly set to 2, 6, A or E)”. Hit the “Save/Apply” button to save the MAC address settings and apply. You can even go to “Run On Startup” if you want to and can switch it on in case you want to auto-populate the MAC address each time you boot. Renaming the computer with every boot is pretty easy as well. Simply change the name “Sample dic.txt” to “dic.txt” or you can assign you own name to the computer list text file. Change MAC Address is a tool that locates the unique MAC address assigned to the network adapter chip by the vendor. Using this tool you can even find those addresses that are hidden for privacy or change them especially when they are used for internet access authentication. Enabling the new MAC address automatically after the modification in just a few mouse clicks. If you are someone who rather prefers changing the MAC address manually, you simply need to follow a few simple steps. Finish by adding a 6 pair MAC address without any space. Save the changes you made to the spoofed MAC address. Firstly, locate your MAC address on your OS X by holding down the “Option” key and hit the “Wi-Fi” button in the menu bar. The codes mentioned at the “Address” section with the colons is your MAC address for your OS X. but, in cases where your address has been modified, you can run the command as “ifconfig en0 | grep ether” to test the address that your computer is using to communicate. Now, whenever you want to change the MAC address of your OS X network adapter you can fix it with the command “sudo ifconfig en0 ether aa:bb:cc:dd:ee:ff”. The MAC address will be then set for en0. If there’s an Ethernet port, you can then set it for en1. On the other hand, if you want security you can rather randomize the MAC address. the command will go as “openssl rand -hex 6 | sed ‘s/\(..\)/\1:/g; s/.$//’ | xargs sudo ifconfig en0 ether”. This will help populate and set up a fresh MAC address for en0 each time you carry it out, however, they are restored on reboot and hence, are not permanent.